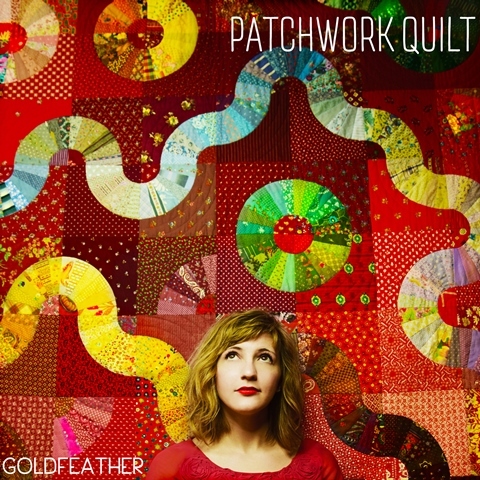 Last week, the Brooklyn – based indie-folk band ​Goldfeather​ released their debut album, Patchwork Quilt. “​In this song, a “Patchwork Quilt” contemplates the helplessness of being left behind as her wooden arrow flies ahead to meet his destiny, and whether these two disparate beings are just too sharp and too soft to reconcile their differences,” as described by Sarah Goldfeather. 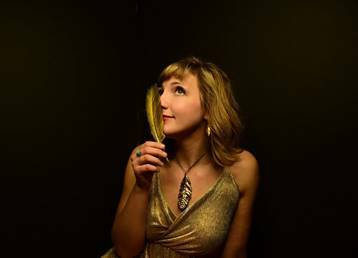 Goldfeather is comprised of Minnesota-native Sarah Goldfeather (founder, lead vocals, violin), Dylan Mckinstry (vocals, mandolin, banjo), Katie Martucci (vocals, guitar), Nathan Koci (vocals, accordion, banjo) and Pat Swoboda (double bass). 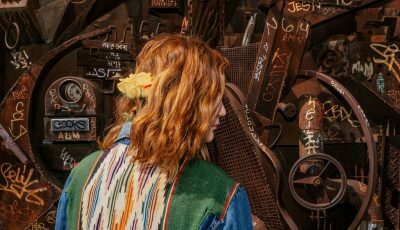 The five-piece takes influence from Andrew Bird and Fleet Foxes, with collective musical backgrounds in almost every genre imaginable — including classical, contemporary classical, folk, bluegrass, electronic, avant-garde jazz, rock and more. After they were holed up in the studio to record their debut LP, ​Goldfeather ​notably teamed up for two shows with 7-piece new music ensemble, Exceptet, which Sarah also founded and co-leads as a violinist. The two groups played the Times Two Series in Boston and the Ecstatic Music Festival/MATA Interval Series at Merkin Hall in March 2016. Be sure to check out ​Goldfeather’s​ website for upcoming tour dates. Goldfeather has had a very good year! Highlights include playing on the Ecstatic Music Festival in NYC, the Times Two Series in Boston, and our Midwest tour. And of course, the forthcoming album release! I suspect that the rest of the band knew early on that they wanted to be musicians – I had a more zigzagged path myself, though music was always present. I started violin when I was 7 (my “day job” is being a freelance violinist and violin teacher), and I have a vague memory of thinking I sounded really amazing when I first picked up my fiddle – the arrogance of youth! My fondest musical memories were most certainly attending summer music festivals and Minnesota Youth Symphonies growing up. I was in a youth chorus as well, but didn’t really consider a future in singing at the time. How did Goldfeather first come together? How did you come up with your band name? 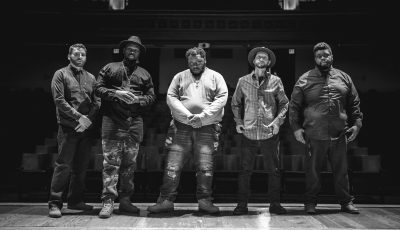 I joined a bluegrass band when I first moved to NYC (which I found on Craigslist), and after that I figured I would try to start my own group, because why not? First it was called Sarah Goldfeather, then Sarah Goldfeather Band, but I always felt silly saying such a syllabic mouthful out loud in serious conversation, so I decided to trash all but my last name – hence, Goldfeather. How do you think being based in Brooklyn has influenced the band and your sound as a whole? I guess we are always influenced by our communities. I do a lot of contemporary classical music on violin so I’d say a lot of that has seeped into my writing. I am constantly inspired by my friends and their music, even when they are completely different genres. So I guess it’s not the location of Brooklyn that has been influential per se, but the musical folks in it. In just a few weeks, you will be releasing your album, “Patchwork Quilt.” Can you talk about the inspiration for this collection? Specifically, where did the title song come from? These are songs I wrote between 2013-2015. I don’t know if there is an overarching theme except the thinly veiled personal trials and and anxious tribulations that have occured a person’s life. I actually wrote the song Patchwork Quilt in a songwriting course at NYU – it was actually workshopped with Rosanne Cash, which was pretty neat. The song basically considers the strain of a relationship between a person who is a unfocused and soft like patchwork quilt and a person who is straightforward as a wooden arrow, and whether the relationship is worth it – “maybe you’re too sharp and I’m too soft/maybe we should call it off.” Then I thought that might be a nice name for an album, so it became the title of the album. There are so, so, so many bands. It is mind boggling! The biggest challenge is to getting people who aren’t your immediate friends and family to pay attention to you in this giant soup of aspiring musicians. 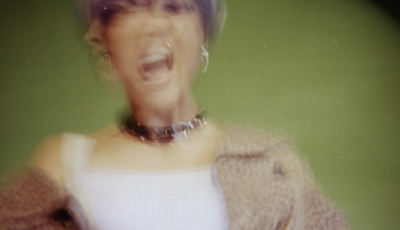 As to what comes naturally…I think my voice is kind of unique-sounding, so I think that might stand out. Of Montreal, Mitski, Anna Meredith, Why?, Sufjan Stevens, etc etc etc…I would love to work with Sufjan Stevens possibly more than anyone in the world. All the basic normal hobbies – reading, riding my bike, playing different music, making puns. I hope they whistle the melodies! And I hope they remember the dramatic arcs…I try not to dwell on any musical section for too long, to keep things interesting. As to other things to share….I have worn two different colored socks since I was 7 years old.